Sharpening the axe: comprehensive spending review II? This article is an excerpt from our Growth Bulletin. To read the full article, click here. To sign up for our mailings, use the form on the left of our newsletter page. Public spending increased by 62% in real terms under the New Labour governments (from £437 billion in 1996/97 to £706.7 billion in 2009/10). As a proportion of GDP this was an increase from 39.5% to 47.4%. By 2009/10, the UK was running an overall budget deficit of 11.3% of GDP. Any government after the 2010 general election would need a credible plan for reducing that deficit. The Coalition set out two new fiscal rules to deal with this. The first was the elimination of the current component of the structural deficit within five years. The second was for net debt to be falling as a proportion of GDP by the end of the Parliament. As we’ve shown before, the first of these rules is largely meaningless, for two reasons. Firstly, the Chancellor has since described it as a rolling target. Secondly, the ‘structural deficit’ is itself determined by the nebulous “output gap” concept (which forecasters disagree on hugely). The second rule is harder for the Chancellor to dodge. But to make sure it does lead to more sustainable public finances, it must not be met through accounting tricks or clever loading of consolidation at certain points in time. What we ultimately need for our economic health is lower government spending and the debt-to-GDP ratio on a consistent downward path. On current policies neither of the rules are going to be met. Though the government is correct to state that the overall deficit (public sector net borrowing) has fallen by over a quarter (29%), on the two targets which the government has set, it is failing. The cyclically-adjusted current budget is now not forecast to be in balance until 2016/17, and only fell by 13% between 2009/10 and 2011/12. 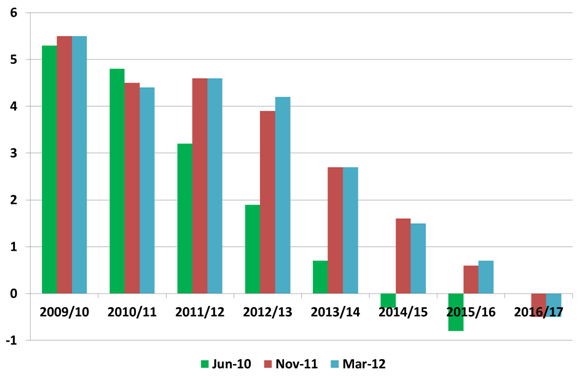 The chart below shows how the forecasts have evolved from the Emergency Budget in June 2010 to Budget 2012 in March this year. Figure 2 shows that public sector net debt was, in June 2010, forecast to peak in 2013/14 before being on a downward path thereafter. 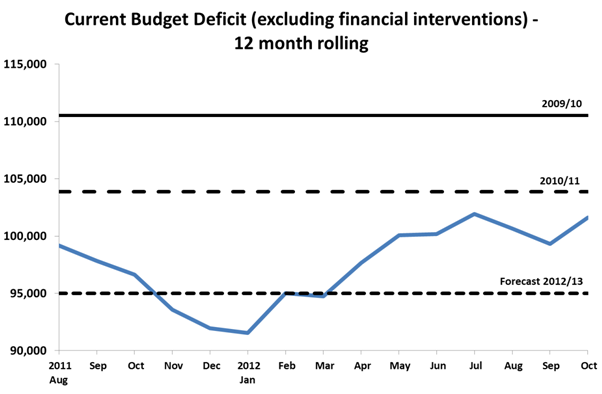 Budget 2012 revised this, suggesting that it would peak much higher in 2014/15 before falling into the next Parliament. With borrowing higher so far in this financial year than expected, and GDP growth lower, it now seems that even this second fiscal mandate will no longer be met. 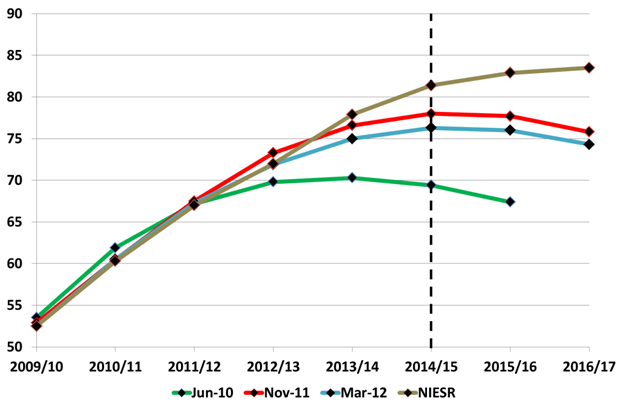 NIESR’s forecast, for example, suggests that the debt-to-GDP ratio will still be rising until peaking in 2016/17. How did we get here? Well, the Government outlined in its 2010 Emergency Budget a fiscal consolidation plan with an 80:20 balance of spending cuts to tax revenue rises. On the spending side, the 2010 Comprehensive Spending Review set out totals for departments for a four year period. On the revenue side, it planned to raise VAT, Capital Gains tax and duties, but was reliant on growth to generate substantial extra tax revenue over the course of the Parliament. With growth having been much slower than expected since then, these revenues have not been forthcoming. So even though the Government has largely delivered on the spending reductions it planned to deliver – spending was actually £8.9 billion less than the Coalition thought it would be by the end of 2011/12 – the deficit is not closing as quickly as expected. But that’s compared to what the Coalition was expecting to do. It’s very stark what has actually happened when you look at the ‘real’ numbers between 2009/10 and 2011/12. In other words, as Tullet Prebon’s Tim Morgan has pointed out: “Government has mopped up most of the skimpy recovery in GDP for its own use” whilst adding over £250 billion to the net debt burden in the first two years of this Parliament. Table 1 shows that there have, of course, been real terms cuts across most government functions, but on the current expenditure side these have been outweighed by the increase in debt interest payments and the rise in the cost of the ‘Social Protection’ or benefits bill. Current receipts are up just 0.4% on this period last year, compared to the Government’s full year 3.7% forecast increase. This is primarily due to a fall in income tax, capital gains tax and corporation tax receipts. Current spending is up 2.1% for the first seven months of the year compared to a forecast 3.0% increase for the full fiscal year. For October, however, current spending was a whole 7.3% higher than this times last year. It seems the generous state pension increase and decision to uprate benefits by 5.2% (in line with the high inflation seen at the end of last year) have contributed significantly to this large increase. The rising deficit means that the OBR will almost certainly give Chancellor Osborne the news that his targets will not be met on current policies. If that happens, the Chancellor will have to decide what to do about the second fiscal rule (the commitment that the net debt to GDP ratio would be falling going into the next Parliament – the first rule we dismiss as meaningless). The Chancellor is in a lose-lose situation here. If he abandons the target, the opposition will have a field day. If he sticks to the target, he will have to cut spending further – not necessarily a bad thing for our long-term economic health but disastrous politically as the next Election looms and the opposition ramps up the ‘savage cuts’ line. That is presuming he does not indulge in some clever accounting tricks (watch out for the interest accounting for QE). This would surely open up the Chancellor to accusations that he is the heir to Gordon Brown. News that the target would not be met on current policy is not the end of the world, economically speaking, and as such should not be corrected through hasty changes to policy. After all, most analysts already expect that this target will be missed. And it’s clear that economic circumstances are much more difficult than envisaged when the rule was implemented. What is more important than is that the government can demonstrate, through action, its determination to reduce government spending and get the debt-to-GDP ratio on a downward path. This is particularly important given the continued worse-than-expected performance of tax revenues. Remember, the last budget already forecast over £600 billion would be added to the national debt in this Parliament. Ending the ring-fencing of the International Aid budget. It is clear that more spending cuts are likely to be needed in the coming years. This needs to be fully acknowledged, even if exact decisions aren’t outlined until the spending review, both to retain credibility with our lenders and to improve our long-term economic health.